Commentators have long lamented the lack of online political activism in the UK - there is political campaigning / debate online, but nothing of the scale recently seen in the US. Part of this is derived from restrictions on party / campaign funding, but another key contributory factor is voter apathy. However there is one thing in UK politics that is guaranteed to create an online response from the public - anything that increases the cost of motoring. 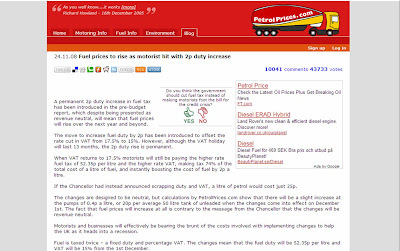 Over 1.7 million people signed the Downing Street E-petition against road pricing in Feb 07 (prompting a response from the Prime Minister) and this week Petrolprices.com has seen record traffic to a blog post about the tax changes announced in the pre-budget report. It is also interesting to look at the source of the traffic to petrolprices.com in recent days. Hitwise reports that '29% of the traffic to petrolprices.com was from email services - seven times the amount that it normally gets via this channel and three times the amount it picked up from search engines.' Email referral and pass on is the key driver for these traffic increases and shows that Search / social media are not the only ways to drive traffic in a short space of time!